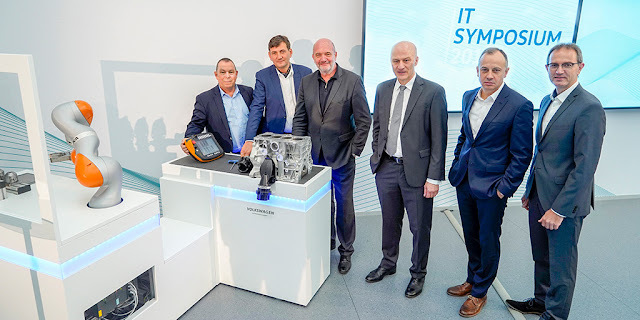 At this year’s IT symposium held in Wolfsburg, the main focus was on digital technologies and innovative projects from all areas of Volkswagen Group IT. The event was attended by members of the Volkswagen Group and brand Boards of Management, top management representatives and the Works Council. The main emphasis of the symposium was on IT innovations to make work and processes within the company even simpler and more efficient. Specifically, the symposium dealt with further digitalization in production, self-learning programs (bots) to support employees with administrative tasks and the "IT for all" initiative. Frank Witter, Member of the Group Board of Management responsible for Finance and IT, emphasized: "Digital know-how is a major factor in the competitiveness of Volkswagen. Group IT plays a key role here; it must safeguard all processes within Volkswagen as a global mobility group and make them fit for the future, at the same time as developing future-oriented digital topics for the company. This is why we continue to expand our IT competence, as we want to offer our customers the best possible product and service experience and to provide even better support for our team in factories and offices, with a view to further improving the efficiency of the company." Martin Hofmann, CIO of the Volkswagen Group, emphasized: "Our most important objective continues to be to create digital solutions that make processes and project work in all areas of business even simpler, more reliable and more efficient. This is why we are forcing the pace of the modernization of our IT systems and developing even more mobile applications. At the same time, we are making advances with future-oriented topics. These include the use of artificial intelligence to provide effective support to our colleagues in the performance of certain tasks." At the symposium, representatives of Group IT presented trial projects for self-learning systems – "bots". These systems learn through smart data analysis and can independently prepare repetitive administrative tasks (such as approvals or the award of contracts) for employees and submit them for decisions. Bernd Osterloh, Chairman of the Group Works Council, said: "The impressive achievements of our IT colleagues demonstrate that we at Volkswagen can and should place more emphasis on in-house developments than on outsourced solutions. For this purpose, we need more IT personnel and more possibilities for the further training of employees. We can only achieve success with colleagues who have the best possible training and are highly motivated. They are the heart of IT." The "IT for all" initiative launched by the Works Council and IT is to give all employees of the Volkswagen brand access to digital media and working tools. The objective is to further improve the preparation, updating and management of time schedules and tasks, communication and cooperation within the team, further training and induction and the rapid distribution of internal messages for employees in factories and offices. A key topic is the increasing use of company or private smartphones to perform tasks.